Транскрипционная пероксисома коактиватора PGC-1alpha является ключевым интегратором нервно-мышечной активности в скелетной мышце. Эктопическая экспрессия PGC-1alpha в мышце приводит к увеличению числа митохондрий и их функции, а также увеличением окислительных, устойчивых к усталости волокон в мышце. При отключении PGC-1alpha во всем организме у таких мышей проявляется очень запутанный фенотип, но они не имеют четкого фенотипа в скелетных мышцах. Мы проанализировали мышечно-специфическое отключение PGC-1alpha у мышей, чтобы идентифицировать роль PGC-1alpha в функции скелетных мышц. Эти мыши показывают изменение от окислительного типа I и IIa к типу IIx и к типу IIb (гликолитические типы). 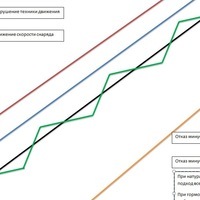 Кроме того, при отключении мышечно-специфического PGC-1alpha у таких животных уменьшилась выносливость и показаны повреждения мышечных волокон и увеличенные маркеры воспаления после равномерного бега по тредмиллу. Наши данные демонстрируют решающую роль PGC-1alpha в обслуживании нормальной мышечной композиции по типам волокон и целостности волокна мышцы после тренировок. Fiber-type switching toward increased numbers of glycolytic fibers in MKOs.A, relative gene expression was measured from cDNA extracted from gastrocnemius and normalized to 18 S rRNA levels. B, cross-sections of plantaris, tibialis anterior, and soleus were immunostained for myosin heavy chains I (red), IIa (blue), and IIb (green).Bars depict mean values, and error bars represent standard error. *, p < 0.05 between control and MKO animals. 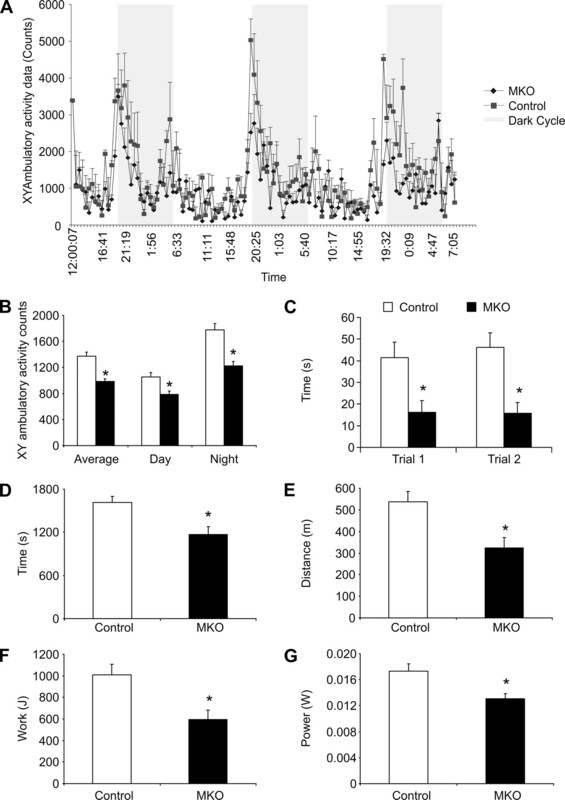 Decreased physical activity and impaired muscle function in MKOs.A, circadian patterns of voluntary locomotive activity were recorded for four light and three dark periods in comprehensive laboratory animal monitoring systems by infrared beam breaking. 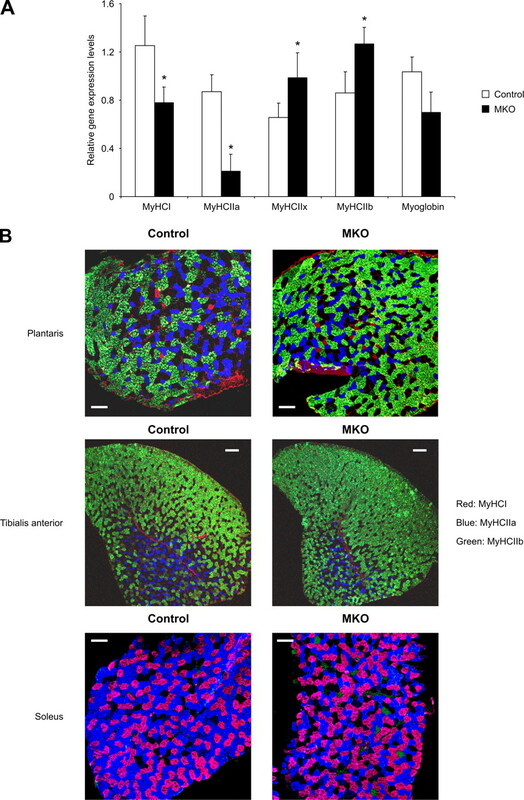 B, average locomotive activity of control mice and MKOs. C, grip strength tests assessed the ability of control and MKO animals to hold onto an inverted grid wire mesh. A maximal score of 60 s was assigned to mice that did not fall down. Trial 2 was repeated 30 min after Trial 1. D–G, treadmill exercise. After acclimatization, mice were run on a treadmill with a 10% slope and increasing speed to exhaustion. Time (D), distance (E), work (F), and power (G) were calculated from the individual performances. Bars depict mean values, and error bars represent standard error. *, p< 0.05 between control and MKO animals. MKOs have damaged muscle fibers.A, hematoxylin and eosin staining of gastrocnemius cross-sections. Arrowheads point to muscle fibers with centrally located nuclei. B, relative gene expression measured from cDNA of gastrocnemius muscle and normalized to 18 S rRNA levels. 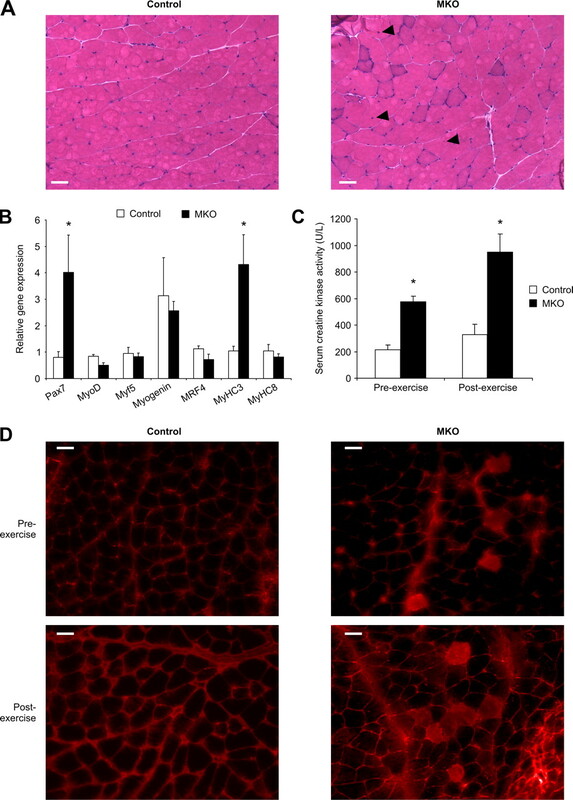 Pax7, paired box gene 7; MyoD, myogenic differentiation antigen 1; Myf5, myogenic factor 5; MRF4, muscle regulator factor 4; MyHC, myosin heavy chain. C, serum creatine kinase levels. Serum creatine kinase activity was determined in sedentary animals (pre-exercise) and mice that were sacked 30 min after the treadmill exercise (post-exercise). D, Evans blue dye was intraperitoneal injected and mice sacked 16 h later. Post-exercise animals were analyzed 30 min after completion of the treadmill running. Bars depict mean values, and error bars represent standard error. *, p < 0.05 between control and MKO animals. 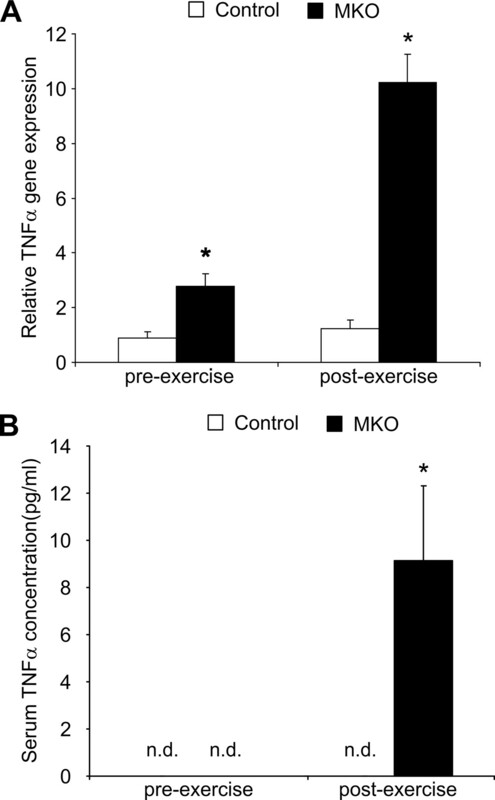 Increased expression of TNFα in MKO skeletal muscle.A, relative gene expression of TNFα normalized to 18 S rRNA levels in control and MKO animals that were sedentary (pre-exercise) or exercised (post-exercise), respectively. B, circulating TNFα concentration in control and MKO animals that were sedentary (pre-exercise) or exercised (post-exercise), respectively. n.d., not detectable. Bars depict mean values, and error bars represent standard error. *, p < 0.05 between control and MKO animals. J Biol Chem. 2007 12 октября; 282 (41):30014-21. Epub 2007 16 августа.a.Handschin C1, Чин С, Ли П, Лю Ф, Maratos-летчик Э, Lebrasseur NK, Ян, BM Шпигельмана.